The sleek lines of this stylishly shaped French Bateau tub are strictly highlighted against the polished aluminum exterior. The polished aluminum exterior is easy to maintain and keep clean. Just a wipe with a soft cloth will remove most marks. Penhaglion is a maker of fine hand finished bath tubs with an exclusive range of Aluminum Skirted Tubs included in its luxury cast iron product line. Penhaglion is one of the first companies to venture into this collection of tubs, which is preferred by builders and designers. Each of Penhaglion’s products are exclusively prepared and presented by high skilled artisans to ensure a superior level of quality. Over time, aluminum has been proven to be a better building material to use when a product is subject to water conditions. Penhaglion, an industry expert, has the largest range of cast iron Aluminum Skirted tubs available. The makers of Penhaglion tubs were thrilled to unveil their new line to customers. To accompany the Aluminum Skirts, consumers will find various finishes offered to bring out the beauty of natural aluminum. Additionally, different styles such as a traditional French Bateau or a classic Double Ended are available in the different finishes. To browse various styles and finishes, visit www.penhaglion.com. The makers of Penhaglion bath tubs present a fine line of bath décor built to last a lifetime. Tub models such as The Wokingham show aluminum’s beauty when highly polished to a mirror finish. 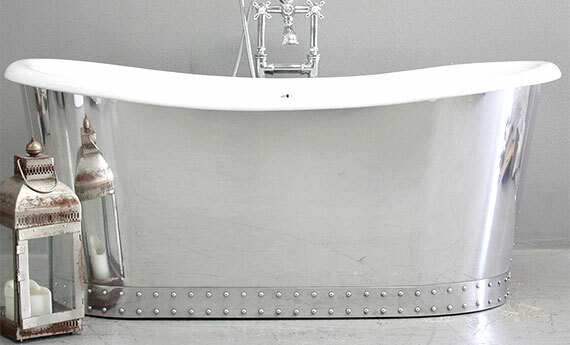 The studded base around the tub and up the side gives the classic tub a modern flare. The Pershore, another model, is unique in how it shows the variation of color aluminum can have. Tub sizes range from 61” to 73’’ for spa-like soaking comfort, so no matter what; Penhaglion can accommodate a customer’s needs. These large soaking tubs add a new and distinctive twist to the classic cast iron tubs from previous eras and allow you to revel in the dimensions of traditional design. Designers and builders have been very pleased with the various sizes, finishes, styles, and price points, making these tubs one of the highest demanding product lines from Penhaglion.